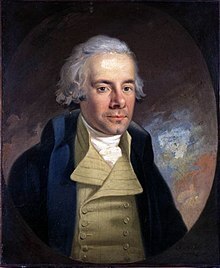 William Wilberforce (August 24 1759 – July 29 1833) was a British politician, philanthropist, theologian, and leader of the movement to abolish the slave trade. 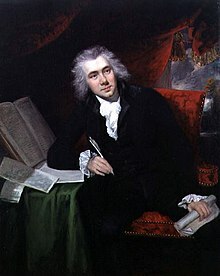 His third son was Bishop Samuel Wilberforce. Having heard all of this you may choose to look the other way but you can never again say you did not know. "On the Horrors of the Slave Trade", speech delivered in the House of Commons (12 May 1789). Speech before the House of Commons (18 April 1791). Close of a speech in House of Commons (1791), as quoted in Once Blind : The Life of John Newton (2008) by Kay Marshall Strom, p. 225. Reported in Josiah Hotchkiss Gilbert, Dictionary of Burning Words of Brilliant Writers (1895), p. 368. Published under this shorterned name in later versions, the full name of this work is A practical view of the Prevailing Religious System of Professed Christians in the Higher and Middle Classes in this Country Contrasted With Read Christianity (1797). This is available at Project Gutenberg. Here we shall best learn the duty and reasonableness of an absolute and unconditional surrender of soul and body to the will and service of God.—“We are not our own; for we are bought with a price,” and must “therefore” make it our grand concern to “glorify God with our bodies and our spirits, which are God’s.” Should we be base enough, even if we could do it with safety, to make any reserves in our returns of service to that gracious Saviour, who “gave up himself for us?” If we have formerly talked of compounding by the performance of some commands for the breach of others; can we now bear the mention of a composition of duties, or of retaining to ourselves the right of practising little sins! The very suggestion of such an idea fills us with indignation and shame, if our hearts be not dead to every sense of gratitude. Here we find displayed, in the most lively colours, the guilt of sin, and how hateful it must be to the perfect holiness of that Being, “who is of purer eyes than to behold iniquity.” When we see that, rather than sin should go unpunished, “God spared not his own Son,” but “was pleased, to bruise him and put him to grief” for our sakes; how vainly must impenitent sinners flatter themselves with the hope of escaping the vengeance of Heaven, and buoy themselves up with I know not what desperate dreams of the Divine benignity! Here too we may anticipate the dreadful sufferings of that state, “where shall be weeping and gnashing of teeth;” when rather than that we should undergo them, “the Son of God” himself, who “thought it no robbery to be equal with God,” consented to take upon him our degraded nature with all its weaknesses and infirmities; to be “a man of sorrows,” “to hide not his face from shame and spitting,” “to be wounded for our transgressions, and bruised for our iniquities,” and at length to endure the sharpness of death, “even the death of the Cross,” that he might “deliver us from the wrath to come,” and open the kingdom of Heaven to all believers. Here best we may learn to grow in the love of God! The certainty of his pity and love towards repenting sinners, thus irrefragably demonstrated, chases away the sense of tormenting fear, and best lays the ground in us of a reciprocal affection. And while we steadily contemplate this wonderful transaction, and consider in its several relations the amazing truth, that “God spared not his own Son, but delivered him up for us all;” if our minds be not utterly dead to every impulse of sensibility, the emotions of admiration, of preference, of hope, and trust, and joy, cannot but spring up within us, chastened with reverential fear, and softened and quickened by overflowing gratitude. Here we shall become animated by an abiding disposition to endeavour to please our great Benefactor; and by a humble persuasion, that the weakest endeavours of this nature will not be despised by a Being, who has already proved himself so kindly affected towards us. Here we cannot fail to imbibe an earnest desire of possessing his favour, and a conviction, founded on his own declarations thus unquestionably confirmed, that the desire shall not be disappointed. Whenever we are conscious that we have offended this gracious Being, a single thought of the great work of Redemption will be enough to fill us with compunction. We shall feel a deep concern, grief mingled with indignant shame, for having conducted ourselves so unworthily towards one who to us has been infinite in kindness: we shall not rest till we have reason to hope that he is reconciled to us; and we shall watch over our hearts and conduct in future with a renewed jealousy, [Pg 243] lest we should again offend him. To those who are ever so little acquainted with the nature of the human mind, it were superfluous to remark, that the affections and tempers which have been enumerated, are the infallible marks and the constituent properties of Love. Let him then who would abound and grow in this Christian principle, be much conversant with the great doctrines of the Gospel. It is obvious, that the attentive and frequent consideration of these great doctrines, must have a still more direct tendency to produce and cherish in our minds the principle of the love of Christ. Christianity is not satisfied with producing merely the specious guise of virtue. She requires the substantial reality, which may stand the scrutinizing eye of that Being “who searches the heart.” Meaning therefore that the Christian should live and breathe; in an atmosphere, as it were, of benevolence, she forbids whatever can tend to obstruct its diffusion or vitiate its purity. It is on this principle that Emulation is forbidden: for, besides that this passion almost insensibly degenerates into envy, and that it derives its origin chiefly from pride and a desire of self-exaltation; how can we easily love our neighbour as ourselves, if we consider him at the same time our rival, and are intent upon surpassing him in the pursuit of whatever is the subject of our competition? Christianity, again, teaches us not to set our hearts on earthly possessions and earthly honours; and thereby provides for our really loving, or even cordially forgiving, those who have been more successful than ourselves in the attainment of them, or who have even designedly thwarted us in the pursuit. “Let the rich,” says the Apostle, “rejoice in that he is brought low.” How can he who means to attempt, in any degree, to obey this precept, be irreconcilably hostile towards any one who may have been instrumental in his depression? Christianity also teaches us not to prize human estimation at a very high rate; and thereby provides for the practice of her injunction, to love from the heart those who, justly or unjustly, may have attacked our reputation, and wounded our character. She commands not the shew, but the reality of meekness and gentleness; and by thus taking away the aliment of anger and the fomenters of discord, she provides for the maintenance of peace, and the restoration of good temper among men, when it may have sustained a temporary interruption. It is another capital excellence of Christianity, that she values moral attainments at a far higher rate than intellectual acquisitions, and proposes to conduct her followers to the heights of virtue rather than of knowledge. On the contrary, most of the false religious systems which have prevailed in the world, have proposed to reward the labour of their votary, by drawing aside the veil which concealed from the vulgar eye their hidden mysteries, and by introducing him to the knowledge of their deeper and more sacred doctrines. In our own days, when it is but too clear that infidelity increases, it is not in consequence of the reasonings of the infidel writers having been much studied, but from the progress of luxury, and the decay of morals: and, so far as this increase may be traced at all to the works of sceptical writers; it has been produced, not by argument and discussion, but by sarcasms and points of wit, which have operated on weak minds, or on nominal Christians, by bringing gradually into contempt, opinions which, in their case, had only rested on the basis of blind respect and the prejudices of education. It may therefore be laid down as an axiom, that infidelity is in general a disease of the heart more than of the understanding. If Revelation were assailed only by reason and argument, it would have little to fear. The literary opposers of Christianity, from Herbert to Hume, have been seldom read. They made some stir in their day: during their span of existence they were noisy and noxious; but like the locusts of the east, which for a while obscure the air, and destroy the verdure, they were soon swept away and forgotten.' Their very names would be scarcely found, if Leland had not preserved them from oblivion. Accepting the position of leader of the anti-slavery campaign. One of the best wats to face this problem of self-centeredness is to discover some cause and some purpose, some loyalty ourside of yourself and give yourself to that something... you are then able to live because you have given your life to something outside and something that is meaningful, objectified. You rise above this self-absorption to something ourside. We lok through history. We see that biography is a running commentry of this. We see Wilberforce. We see him somehowe satisfaying his desire y absorbing his life in the slave trade, thos who are victims of the slave trade. Rev. Martin Luther King Jr., The Papers of Martin Luther King, Jr: Symbol of the movement, January 1957-December 1958 (2000), p. 253.